A better way to learn more about our country’s culture and history is to travel to Northern Luzon on a shoestring budget and experience the local life, history and its natural wonders. Take delight in riding the kalesa in Vigan and marvel at its old world charm. More history awaits in Laoag with museums and old structures. There’s fun and excitement at Paoay’s sand dunes. On top of all that, serene white beaches in Pagudpud is such a relaxing retreat. After spending a night in Vigan, we waited around six in the morning for the Partas bus to go to Laoag. It took us almost 2 hours to arrive in Laoag’s bus terminal. We had an early lunch near the Sinking Bell Tower. From here, we asked around and commissioned a tricycle driver for ~P500 for our Laoag-Paoay tour. Later in the afternoon, we enjoyed surfing the sand dunes of Paoay. The next day, we headed to Pagudpud to enjoy the white beaches and its many beautiful spots via tricycle tour. 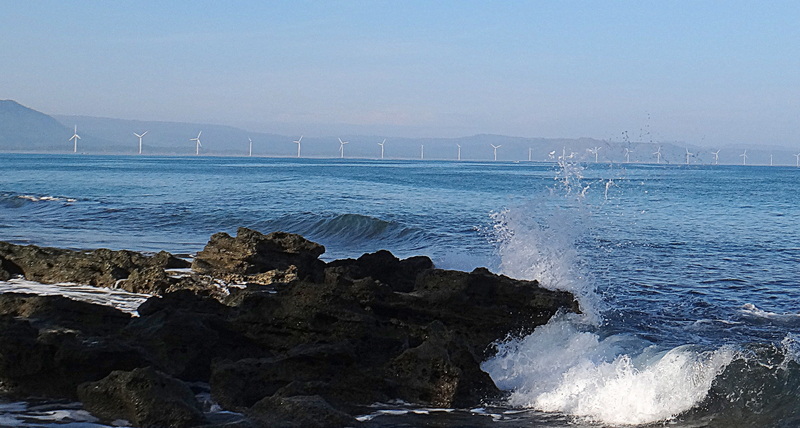 After that, we went to see Bangui windmills and Kapurpurwan rock formation, then off to La Union for the surf swells. We will always admire the simple pleasures in these laid-back towns. Our first stop is one of the baroque churches in the Philippines declared as a UNESCO World Heritage Site. We tried the Pinakbet Pizza at Herencia’s and it’s really tasty! Filled with Ilocano favorite vegetable mix ingredients: eggplant, string bean, okra, tomato and green pepper. This gourmet pizza served with mozzarella cheese makes up a unique gastronomic experience. Plus who would have thought you can add bagoong (fermented minute shrimp) as toppings — no need for hot sauce to complete the day! I remember it being featured in one of the local travel shows. The restaurant with a vintage ambiance can be easily spotted near in front of Paoay Church. A former two-storey residence mansion of the Marcos family is one of the best examples of old Filipino-Spanish house design. It is overlooking the serene Paoay Lake. Inside, you can find Ferdinand Marcos’ office with shelves of books including the books he published, old-fashioned beds, paintings, old elegant furniture and other interesting collection pieces from the 70’s. Nope, we didn’t stay here — their rates are not within our budget range. This resort is just a few minutes ride from Malacañang of the North. At first I thought it was a museum because it looks vintage. But this sure is an excellent beachfront stay. We just surveyed the area. If you want to treat yourself an adrenaline pumping experience then sand boarding at Paoay Sand Dunes is worth a try. It costs Php2,500++ for a 4×4 truck tour. The roller-coaster ride at the jeepney back while standing is such a thrill. The guides will teach you how to surf the sands. I was pretty stoked. 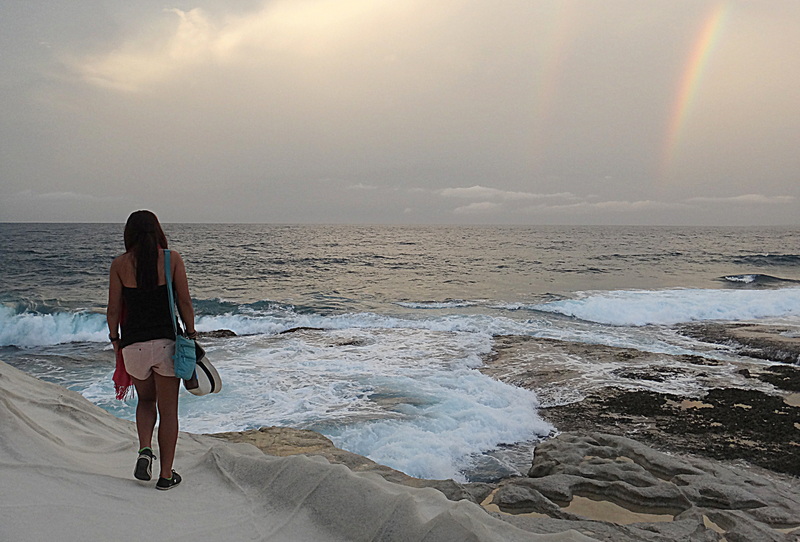 Not to mention, the view is breathtaking here–I love watching the waves crashing onto the beach. Sand surfing is such an exhilarating experience. @Paoay Sand Dunes, Ilocos Norte. The museum house beside it was closed during our visit but we did wait together with other tourists to enter the mausoleum and viewed the well-preserved body of the late president surrounded by flower and shell ornaments. There is no entrance fee and you are not allowed to take pictures inside. Beside the mausoleum is a local restaurant, Johnny Moon Cafe, known to serve some really appetizing Ilocano dishes. We did not dine there as we can’t handle eating another meal in the middle of the afternoon. Going to Pagudpud. After the mausoleum visit, we asked our tricycle driver-guide to take us to the bus station to catch a mini-bus bound to Pagudpud. It was about 2 hours of travel. We texted Ma’am Cathy that we have arrived and she then had a tricycle driver picked us up at the bus stop and took us to Cathy’s Homestay. We ate the left-over pinakbet pizza we bought at Herencia’s for dinner—it still tastes good even if it’s already cold but guess we are just hungry. The rent was for Php1,000++ per night and you can ask her to cook you breakfast for Php100++. You can contact her at +639 919-5716680. She was very responsive to our inquiries. The next early morning, we surveyed the area and found a scenic view of Bangui windmills. Bangui windmills view from Saud beach. Also found many other hostels in the area and a really charming beach. There are plenty of choices to stay near Saud Beach but we’re fine staying in a homestay. We took a quick dip in the clear turquoise waters of Saud Beach early morning and after lunch. The sand really feels good on your feet and the great thing was the beach was all to ourselves. 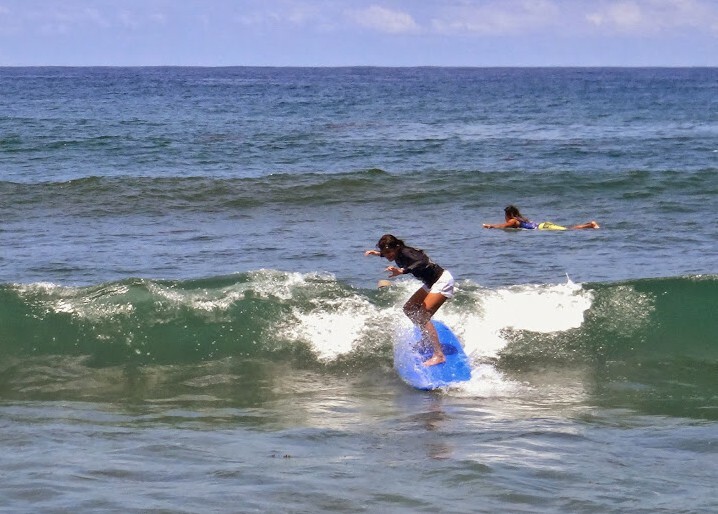 I heard that during monsoon season, you can surf the waves here in Saud and in Blue Lagoon nearby. This makes it a perfect beach! Saud Beach. Secluded Beach of Pagudpud, Ilocos Norte. By 7am, we started our Pagudpud tour for Php1,300++ which I think was a bit expensive considering that we still need to pay some entrance fees to the sites which we weren’t clearly told earlier. We toured Pagudpud by tricycle with Kuya Raph (+63 929 146 2505) as recommended by Cathy. 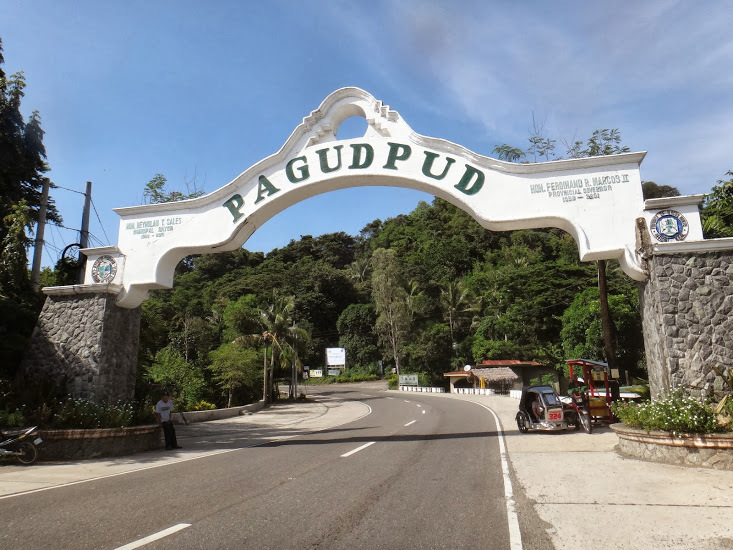 There is nothing really interesting about this site except that it is a sign that you have crossed the boundary to Pagudpud. For around 40 minutes, we trekked through the rice farms and small rivers to get to this waterfalls. Not as interesting as the Kawasan Falls of Cebu or Tinago Falls of Iligan, but it is great to have a quick dip in its cool waters. This is a good way to give yourself a time to sweat out. Patapat has a beautiful view of the winding road by the coast and mountainside. Not really a cave but has a cave-like hole with a stunning sea view and cool breeze. They said it used to be a small cave that created an ‘underground sea’ but a strong earthquake destroyed parts of it. I think I have my best photos here. (Thanks Dorothy!) Php25++ entrance fee. They have a long strip of white sand beach where many hostels are located nearby. These are not really spectacular sites and not really worth the extra fee for the tour. But if you have extra time, why not tour around and just enjoy. Agua Grande – a flowing water on rocks to the sea. Php25++ entrance fee. Dos Hermanos – a couple rock formation. Php10++ entrance fee. Timmangtang Rock – just a big boulder known as “Lovers Rock” with grass and small bushes growing on it. Paraiso ni Anton – a small grotto. The Bangui Wind Farm is definitely worth a visit. I love the sea breeze blowing through my hair and the view of the giant wind turbines. You can also get a chance to ride a pony for a small fee. It was a lovely visit to this historical 120-year-old lighthouse where we enjoyed taking photos. We met a young couple who had their prenup shots here. From the tower, you can get a gorgeous view of South China Sea. Parola ng Cape Bojeador or Burgos Lighthouse. We rented another tricycle for Php300++ and paid another entrance fee. This is not inclusive of our tricycle tour package. It took us an hour to reach here. We had a great time enjoying the spectacular rock formation and the soothing ocean view. Glad to witness a double rainbow. After having fun in Kapurpurwan, we waited for almost two hours for the bus in the highway that it was already dark before we got on a Manila-bound bus. Buses usually come by 30 minutes to an hour gap, but they said that after 5pm you’re going to wait much longer. Thanks to our tricycle driver who stayed to accompany us while waiting. We arrived a few minutes after midnight at Monaliza Surf Resort in San Juan, La Union which wasn’t really our plan. Luckily, the daughter of the owner, Mona, was kind enough to entertain us that late. We are really sorry to have disturbed her good night’s sleep. Our Northern Luzon trip was long and tiring, but it was definitely an awesome trip with many picturesque sites for an instagrammable photo collection. Beautiful Northern Luzon! 16:30 ‘Pasay to Laoag’ Bus Ride. Stop at Vigan. 16:45 Museum Crisologo. Other Museums are closed that time and it was raining hard so we ended our tour here. 17:15 Back at the Transient Homestay. Rest. 13:00 Paoay Church. Herencia Restaurant. 8:10 ETA Jump off Point Kabigan Falls. 10:00 Paraiso ni Anton. Grotto. 10:40 Bantay Abot. Door View. 17:45 Back to the Registration Point, Wait for Bus. 19:30 Finally Rode a Bus going to Manila so we can stop at San Juan. Pingback: Vigan: Heritage Town | Digesting Healthy Thoughts.